Good timing. I used a version of this in an interview I did just on Monday. Good thing I have already studied “HCICC?” because my answer was neither canned nor meandering, but natural and focused on the work I’d be doing. It must have been effective, because the manager called me back Monday afternoon and to make an offer. I’m considering it as one of three. Thanks for your help, Nick, and to Ramit Sethi. Ultimate thanks go to Brooke Allen, who introduced both of you via his wonderful blog: “No Shortage of Work” (the truest statement in the history of job hunting). I like pulling in the work and shirt sleeves white board ideas, even if you don’t actually step up to one. You run the small risk of appearing to be jumping the gun and spurning the question altogether, but it may be worth it. They may want to see if your self perception matches what’s on the resume. A far worse trap is the question “What are you looking for?” The interviewer may have already determined you may be outsized for the role they have in mind or suspicious about your ambitions. Simply repeating the job description will sound patronizing, while describing another role will have the effect of taking yourself out of the picture voluntarily. (Every screener would love to have you voluntarily scratch yourself off and save him the trouble of doing it for you.) I’d like to hear about a “safe” way to handle this. I love this answer and have used it myself a number of times. However, more often than not, it becomes a way for me to tell if the company is going to be a good one to work for. I’ve found that if the company is going to be good to work for, they understand how I’ve changed the direction of the conversation. But they take the change in good grace and start talking about the work. If the company won’t be good to work for, they they take offense. Or they start to openly get sarcastic about the things I’ve done. I’ve said I wanted to do x, y, and z from the job description, and how I’ve done x, y, and z in the past. Then I turn around and explicitly say the company has an opportunity to hire an experienced person who can give them a competitive advantage because I can do things rapidly and with good quality. Then I tell them I read the job description, and I agreed to it before I came to the interview. I agree, this one may be dangerous. Once, long ago, in response to the question’s ugly twin brother, “where do you see yourself in five years”, I responded something I thought the HR guy would like to hear about Big Ambitions. His response was clear: “Then this position is not really for you”. If I had provided the true answer, doing geology, I would actually be in line with the company’s expectation! Spent the rest of the interview doing patethic damage control. Result: Due to all the stupid HR people out there, I lost a job and they a good worker when I actually encountered an honest HR man. When I got my first job after my PhD, I got the “what’s your weaknesses” question, and responded with some actual pros and cons about me, but also pointed out that most people would reply “I am stubborn”, because that can also be regarded as something poitive. The HR woman’s reply was that 90% of people say that. So…I wanted to ask…why do you ask the question then??? This may be an example of grabbing the HR bull by its horns, by saying, cheerfully, that you know the questions and answers are likely to be canned. Looses tension without embarrasing the HR people too much. (BTW, I had that job for 3 years and really liked it. Quit due to relocation). The key, as has been noted, is to focus on the work and value that you will deliver. If the interviewer doesn’t understand and/or appreciate that approach, you probably don’t want to work for him/her. When you interview someone, make them the star. Not the witness in the trial of the century. That might sound strange but most of us respond better to positive reinforcement than the negative variety. If you ever played organized sports, who got more out of you? The insecure screaming coach or the calm one who brought the best out of you? I went on an interview and the interviewer said “tell me one thing about yourself”. I told her that one thing wouldn’t be enough to find out anything about me. She insisted. So I stood up and shook her hand in introduction, and announced my full name. I think you should do a newsletter on how to weed out interviewers, so you can find the good ones. What I don’t want to have happen is for interviewees to go to an interview, handle as best they can these inane questions, and then when they don’t get the job, think that they need to change their answer so that they could have gotten that job. @Lucille: Bingo! This approach to the question reveals so much about the employer, and helps you decide whether you want to work there. Let’s not forget: That’s the other purpose of an interview. It cuts two ways. Amazing how employers blow it! Over time I came to the conclusion that I wasn’t there to apply (or supplicate) for a job, I was in the business of negotiating a sale of my services with a client. If you are going to invest years of your career building this person’s enterprise, qualifying the prospect is a must. You only need one great client at a time. Sometimes the other half of the business equation will approach the table with a plantation mentality. Sometimes they conduct the discussion (a term I prefer over ‘interview’) as a gauntlet of trick questions or gotchas to be navigated with magic answers. You have your red flag when a company’s representative assumes that pre-employment meetings are fair game for behaviors that would be graceless in any other context. If this is the first date behavior exhibited while you are on the front steps, you already have your trial balloon that suggests how they will behave once you are on the other side of the front door. I disagree with this whole approach to the question. When I’m conducting interviews, I always open with “So tell me a little about yourself” because -gasp- I want to know more about you! I’m not saying I care where you were born or how many cats you have. I’m saying give me a short narrative introduction to who you are and what you’re about. This is a polite way to start a conversation. I would be immediately peeved if a candidate told me point-blank they were not interested in answering my question and instead wanted to talk about work projects they’d done. If you can’t talk comfortably about your professional self for 30 seconds as a friendly opener, what on earth are you going to be good at talking about? I have no problem discussing specific, possibly ambitious long term goals with a potential employer. In my mind, the only wrong answer is “I want to be doing the same job forever and ever and only get raises to keep up with inflation.” or a completely aggressive answer. The reaction and discussion that ensues is important especially if the job turns not what you expected. I’ve turned down job offers based on their reactions to my reasonable goals. Any company that does not have congruent goals to yours is probably not worth working for in the long term. @Kim: I was just going to say that. I completely agree! @Kim Just wondering how you would answer this question. What kind of information are you looking for? Personal info? When asked that question in an interview, I assume they want to know about my work. @Melissa: Not really looking for personal info. I assure you, there will be plenty of time to talk about projects. What I want is, as the above candidate rejected, an executive summary about yourself that is tad more personal than what I saw in the cover letter… especially since many people don’t bother with that in their cover letter anyway. Not personal, maybe, but conversational. Colloquial. Showing me that you have the ability to be at ease in a professional conversation with someone you’ve never met. @Kim: (And this isn’t directed at you — it’s more of a ramble…) I appreciate your interest in learning about a person. But this is not someone you met in a bar, restaurant, at the movies, at a friend’s house, or at church. You (any employer) invited them in for a job interview, and the implication (naturally) is that you’re assessing them for a job. That’s the context, and that’s their expectation. While I’m all for everyone getting to know everyone else on friendly terms, I don’t think it’s appropriate to toss out a blue-sky “Tell me about yourself” question to someone applying for a job. The universe of “about yourself” information is enormous. If the purpose of the question is to “see what they focus on,” then I think that’s sneaky. While it’s critical for an employer to get good insights about a person’s character, I’ve always been mystified at employers who open up with such a general, personal question — when the primary factor in continuing the interview is the person’s ability to do the job. End of ramble. I wish employers would stick to the purpose of the meeting, and accept that the personal stuff comes off the interview almost as a spare artifact. Because the personal stuff should not be the basis for assessing the candidate. Yes, I hate this question too. In the past, I haven’t known how to respond to it, and I like the idea of taking charge of the interview by demonstrating what I can do for the employer. After all, that’s why I’m there…to audition for the job, and the best way is discuss what I’ve done in the past and how I can make a success for this employer. There’s plenty of ways to show character and goals in this process via a discussion about work and projects and how I solved problems and crises. @Kim: it is nice that you genuinely want to know something about the person you’re interviewing, but asking such an open-ended question can lead to confusion. Do you want to know something personal? Is this a backdoor way to ask “illegal” questions (marital status, number of children, etc.)? I assume that employers don’t care that I played rugby, or that I like to read or like to bake, or that I’m an exercise/fitness nut. I assume that employers care about whether I can do the job or not. They might like a candidate, but if she can’t do the job, it doesn’t matter that she bakes delicious chocolate-chip cookies or that he’s a wicked center in the local adult basketball league. And yet, personality and “fit” with the corporate or agency culture is very important. A candidate might be able to do the job, but if s/he isn’t a good “fit” for the company, then it won’t work either. I just think that there has to be a better way to interview candidates and for candidates to interview employers than asking such broad, open-ended questions that confuse candidates. And yes, the other stupid question is “where do you see yourself in 5 years?”. If you get an insecure interviewer, a discussion of career goals may threaten him, and he’ll cross you off the list. No sensible employer would want an employee who is content to stay where he is, but the very human insecurities, jealousies, and more make answering this question challenging unless you have an inside scoop on the interviewer. Otherwise, it becomes “if I say I want to be director, will he be threatened because that’s his job or his boss’ job or will he be impressed because that shows I plan to stay a while and can learn”. Other stupid questions: what kind of animal (or color) would you be. @Lynda: Yes, I agree that a good interviewer should be able to make the candidate feel comfortable, but I’d take going through voir dire over a bumbling, incompetent interviewer anytime. Speaking of that other stupid interview question… Where do you see yourself in 5 years? I agreed with your first post, and loved how you *answered* your own question. It seemed perfectly natural, totally job-focused. And opened up a little bit of information for a welcome moment of ice-breaking. “If you can’t talk comfortably about your professional self for 30 seconds as a friendly opener, what on earth are you going to be good at talking about?” A very fair question! I mean, I meet new people all the time and the worst was one woman (at a conference cocktail party) who refused to say one word about herself … not even what she liked about our city or her own. That’s a little different from job interviewing, I understand. But I still think your overall point was well-made. An adult should be prepared to make a moment of appropriate small talk for common situations, if only because it puts other people at ease! The problem with both the “tell me…” and the “five years” queation is, as others have pointed out, that they are so open. If you want to know my professional backround, ask “what is your professional background?” And, what’s wrong with a career ambition consiting of doing the same job for a long time, as long as the job is done properly? The fundamental problem is that, as long as the candidate does not know what the interviewer wants to hear, the candidate may say what he/she think they expect, rather than the truth, for fear that a wrong answer about the future may wreck the job in the present. From a candidate point of view, I agree that this is an opportunity to find if one fits with the company – if the company does not accept the five year question answer, one does not want to work for it. And, one could also argue that if candidates think interviewers play with them, that’s the candidate’s problem. Unfortunately, there is a reason why such a perception has emerged. A second thought: Kim makes a very valid point. Companies would like to get to know you, and who want to hire a person who cannot interact with others? If the company can ensure the candidate that the question is an invitation to a professional discussion, that the five year question is not a test but to initiate a mutual discussion on whether company and candidate fit – then all well. I feel too many jobs posted today are already filled by HR friends and relatives, and this is a good example in my opinion of bullshite, anything that includes the words or phrases: reach out to you (major cringe factor,) candidate, mutual discussion, test, five-year, etc. etc. just get to the damn basics, pull out a freaking whiteboard and show them what the hell you can do, or walk out. I would never ever play “Mother May I” with people who ask moronic questions. What is an applicant really going to say about themself to such an idiotic question as “Tell me about yourself?” I would respond this way, “I can tell you one thing, I don’t waste my time. I will tell you what I have done, and can do right now, otherwise I know where the door is and I’ll use it.” I cannot stomach canned bullshite language by HR people. What I find interesting are those that will not read a job description or announcement enough to respond to specific questions and provide a coverletter. Case in point, we posted a position requesting specifics be responded to in a coverletter and out of 20 applicants only 1 provided the information. As a note, the position is one of very detailed work and involved in potentially hazardous situtions. If you can’t follow simple directions in applying, why would I even want to interview someone who may not following instructions in a potentially dangerous situation. While I agree with you in principal, not all situations are alike. For example, I’ve been in situations where job descriptions/postings/requirements sounded good on paper, but when you get into the job interview and started to talk shop, it was a whole different story. It’s not so much that this is the problem. For example, I don’t think I would be a good manager – I like to work on solving actual problems, doing the nitty gritty work. But on the other hand, I’d like interesting, challenging work. If I’m profitable, I would like to be compensated as such. That’s the problem with vague opened ended questions. The problem from where I see it is that I can be honest, and it still won’t be what they want to hear. Although the question “Tell me a little about yourself” bears the illusion of being open-ended, it comes with very specific expectations as to how it is to be answered. In spite of the conversational tone, the response I’ve found most likely to encourage moving past formalities is the answer you would have given Art Fleming if you were competing on Jeopardy. This avoids voluntarily violating the personal info firewall, though it tends to sound like the resume summary the interviewer already has in hand. If you want to “break the ice”, genuinely thank the person for coming in, ask them upfront the correct pronunciation of their name if it’s questionable (instead of hoping they’ll tell you in an impromptu monologue) and then ask how they came to be interested in the position. That should be enough to warm up the conversation before getting into anything heavier. And from my personal experience, if you’re in HR, try to have a personality. Some do a good job and you’re able to walk away with memories of a pleasant experience – even if you didn’t get the job. But the majority of the time they’re cold, won’t look you in the eye and seem to have so little enthusiasm about their own job that before long you start wondering if you want to work anywhere near these people. Thank you. (Steps off soapbox to thunderous applause). @John: Touche! If I were the VP of Sales you worked for, and I found out about this, I’d fire you. If I were the prospect, I’d ask you what you were doing wasting my time if you didn’t already know an awful lot about me. @Mark: good points. And I think that’s what is so confusing about the open-ended questions like “so tell me about yourself” in interviews. If I’ve made it to the interview stage, it means they have my résumé, and I may have even had to fill out an application. Since my résumé has been updated and includes projects, successes, etc. as well as where I’ve worked and where I’ve gone to school, the interviewer has my professional background in front of him. I don’t put personal info. on my résumé such as marital status, hobbies, and other interests. If, as another poster noted, the “tell me about yourself” isn’t asked to glean personal information but professional information, and the interviewer has your résumé, then it is a pointless question, assuming the interviewer has read my résumé. Fit is important, but there are better ways to determine if a candidate is a good fit or not. Asking direct questions, being honest about the company, job, and culture, and the candidate has some ownership too–I’m being interviewed, but I’m also doing the interviewing because I want to make sure the job and company are a good fit for me too. It’s not just the resume in many cases as I link to my homepage/portfolio (that I am slowly working on), linkedin, stack overflow, and working to put some of my projects on github. Why ask open ended questions like “Tell me about yourself” – You should already know what I want, what degrees I have, where I worked, some of my accomplishments and work samples. Isn’t the next logical step asking me specifics about what I’ve done and how I got there? I also treat the interview as a chance yo interview the company as well. If they can’t answer my specific questions I have, then it’s not worth the move. The signal to “Run, Don’t Walk” out of the interview is when the interviewer starts asking questions that indicate he or she has not read your resume (assuming they have it). My guess is that happens about 50% of the time. I’ve chewed out my own clients for doing that. @Nick: re your comment about “run, don’t walk” out of the interview. Yes, you’re right. That’s why I think “tell me about yourself” (assuming the interviewer doesn’t want to know about my non-work life and interests) when he has my résumé is silly at best and stupid at worst. That is my assumption–that the interviewer hasn’t read my résumé and is going into the interview blind. That means he’s green and doesn’t know any better or that the company is having problems if the folks who are interviewers aren’t trained enough to read résumés before the interviews. It’s also rude and a waste of time. If the interviewer is just green and doesn’t know how to ask the question “how does your current (or past) experience translate to the job you’ve applied for?” In other words, how would you use those skills to solve our problems? That would give me a chance to show you what I can do for you. But a vague “tell me about yourself” doesn’t communicate that. As a job seeker, I read the job description carefully. I tailor my letter, résumé, and cover letter to that particular job, and re-tailor for each job I apply for. I research the name of the person in the dept. that has the job vacancy, address correspondence to him. I prep my references. I research the company or agency and learn all I can about them. I anticipate problems that an employee is expected to solve. I go prepared. I do my homework. So I don’t think it is too much to expect that the interviewer be prepared too. Maybe I am expecting too much. I had spent too much time preparing for this interview to bolt. I knew I wasn’t going to get the position, so I decided to make his long day even longer. I refused to end the interview. He squirmed for half an hour while I waited for questions. I showed him my portfolio of accomplishemnt, which he strained to decipher as though I were asking him to translate esoteric hieoglyphics. Obviously, if he had no understanding of my work, I would not want to work for him, but I was still determined to have him end the interview. Finally, he found an exit, and we shook hands goodbye. I did the thank you thing, even though it was the worst interview of my career. Next time, I will bolt, reminding the interviewer as I’m leaving that once upon a time, college professors would shut down class for the day if the students didn’t read the assignment. To get back to the original dumb interview question, it is my most hated question. My answer would probably be, “Well, I’d love to tell you about myself, but then I’d have to have you placed in Witness Protection. I don’t think that your family would like that”. “I would rather tell you about my work. Let me show you some samples . . . ” as I open my portfolio. No you’re not expecting too much. I think there are several issues at play. People get stuck in traditional recruiting – post a job, get 5,000 resumes, have to sort through them all in 2 hours. Interview 10 people in two days so they can’t review their work and come up with thoughtful questions. And so on. I also think that many managers/recruiter types don’t hang out in the right places – their work day ends at 5pm. 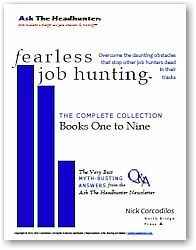 I know many people who are very good are passive job seekers or do very targeted searches. You’re going to have to cast a very wide net to get these people and spam/job boards won’t catch them. And 99.9% of all recruiters I have met don’t know enough about what I (want to) do. So how can we talk about the nitty gritty of it? @Dave: Now we’re getting to the heart of the matter. 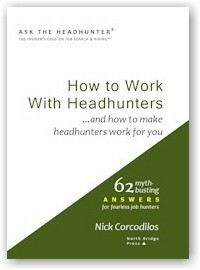 It’s why I publish Ask The Headhunter. Recruiting, interviewing, and hiring — it’s become a very stupid process. It’s a volume business. Employers spend more time dealing with the volume than with actually recruiting and interviewing. It’s why most interviews are a waste of time — what’s the point in interviewing 10 candidates? If someone is doing their job right, they don’t NEED to interview 10. But “volume” is the name of the game. That’s why HR talks about “keeping the pipeline full.” While Roto-Rooter advertises the importance of keeping the pipeline CLEAR. Less is more. If employers actually recruited who they needed, rather than open a fat pipeline, hiring costs would go down, errors would diminish, and the employment system would properly get flushed down the tube along with the databases full of drek. But no one wants to do the work of actually finding and recruiting the people their companies need. Instead, they wait to inteview WHO COMES ALONG. HR spends billions every year propping up the job board database industry — which just fills up that pipe and increases HR’s costs. In that sense, everyone is on the take — feeding off that system, but getting little done. This is the phenomenon that makes HR complain of a “talent shortage.” There’s a 4:1 ratio of unemployed talent to open jobs — and HR can’t fill the jobs??? If I can teach anyone just one thing, it’s “Don’t apply for jobs that come along, and don’t hire people who come along.” Go find what you want, and then pursue it like a mad dog. That’s how to stand out. Standing out has never been easier. @Karsten: there’s absolutely nothing wrong with wanting to keep doing the job you were hired to do if you love that job. But suppose the industry/technology/format/job changes? Suppose the job you were hired to do becomes obsolete? Would you rather stay with the company doing another job that you’d have to learn or get laid off? I understand that not everyone wants to go into management. I’ll give you an example. Years and years ago, I worked in libraries, not on the circulation desk but in cataloguing. Cataloguing was an entirely behind-the-scenes job. Most people who go into libraries don’t know cataloguing exists, and if they do, they have no idea what cataloguers do. We order, receive, discard books. We assign call #s to new books, update the catalogue so you (patrons) can find them even when you don’t remember the author or title. This also applies to audio-visual materials (dvds, cds, etc.). When I first started working in libraries, the catalogue was the card catalogue; nowadays, there is no more card catalogue but this information still has to get entered and updated into a computerized “card” catalogue. If you were a librarian or even a clerk 30 years ago, you would have worked nearly exclusively with the card catalogue. You might have had an internal computer system, but it wouldn’t have been accessible to the public, and it wouldn’t have been very sophisticated. The shift started to occur in the mid 1980’s to linking books to records in a computer database, but you would have still worked with the card catalogue. The computer database was for the library staff, not the patrons. And since there was no internet, there was no way to check if other librarians had materials. If you were working in libraries when the shift occurred, you could still do your job in cataloguing, but the WAY you did it would be very different because of the increasing sophistication of computers. The old card catalogues have been consigned to scrap paper, but that doesn’t mean your job went away–you’d just be doing it differently. Yes, it would mean a lot of training so you’d know how to use the systems, but assuming that you could learn, wouldn’t you rather have that option than being forced to find another job or even another line of work, especially if you liked being a cataloguer? Or let’s say that you work in sales, and the company you work for no longer makes Xwidgets because they sold that part of the business to a competitor and the competitor outsourced the manufacturing of Xwidgets to China. Your company now sells a different product; you like sales. You can still be a salesperson, but you would have to learn about a new product and there’d be a learning curve, plus developing a new clientele. You’re happy at the company. There’s no reason to leave except that the company no longer sells the products you have sold for them for the past 20 years. Could you stay and learn to sell a different product or would you rather leave and try to find someone else who sells Xwidgets? @CDU: I’m sorry that you had that experience. I, too, wonder at the arrogance, or maybe it is ignorance, of interviewers. I got a bit of that kind of attitude when I phoned the hiring manager. His attitude was that it was all my fault that I’m unemployed and that means there is something wrong with me. I was sorely tempted to get sarcastic and snarky with him, asking him if he lived under a rock or in a cave these past 4 years (I haven’t been unemployed that long, but it has been 1 1/2) and doesn’t pick up a newspaper, a news magazine like Time, or have a tv and doesn’t turn on the news. Despite the claims that unemployment is going down, employers in my area aren’t hiring, which leads me to ask what kinds of jobs are being created? McJobs? Temporary/seasonal jobs? Part-time non-benefitted jobs? Minimum wage jobs? Jobs in China? I also think there’s creative statistics re jobless numbers, just like Enron had creative accounting. They stop counting once you’ve been unemployed longer than 99 weeks, if you stop looking because you’re so discouraged, if you get temporary work, etc. I truly suspect that the unemployment numbers are much higher and that if you add the number of people who are underemployed or who aren’t working in their field (like the civil engineer I met who was working part-time at Home Depot). And yet, as Nick says, employers and HR bemoan a talent shortage and claim that they can’t find qualified workers! But these same people rely on a computer to sort the résumés for them (keywords are important) and put stupid restrictions in place–the unemployed need not apply, and they discard you if you’re older, if you’re female, if you have a degree (overqualified), if you lack at least 5 years of experience, if you don’t have a degree (let’s say at least a Bachelor’s degree). There’s plenty of good, experienced, smart, qualified people out there. They’re probably unemployed, and they might very well be older and more educated and experienced, but HR and businesses have blinders on and let the computers do the “thinking” for them. I’m frustrated too. It shouldn’t be this hard, and I just don’t know how to breach that gap. I’m willing to work hard, but I can’t do it on my own. I need an employer to meet me a quarter of the way in order to get over the gap created by computer systems designed to screen me out and stupid qualifications (like the unemployed need not apply). Oops–I meant 1 1/2 years! Mea culpa. you’ve probably said about 90% of what i’ve been trying to say! the universe protects you in strange ways! Good points. The reason for my little soundbite was that, in interviews, one is often suppposed to show leadership, being eager to learn new things etc – but, of course, not be arrogant or unrealistically hungry (or grab the manager’s job). Therefore, the expected, correct answer is to climb a bit, become a project leader, want to dedicate yourself to the job – but not to say that you are satisfied with being a good technical worker (“no ambitions”) or to become a manager (“no self insight”). Which, in turn leads to canned answers. 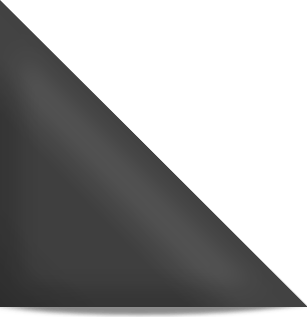 @Nick – And thank you for writing! It would be nice to actually have an actual chat about their needs, rather than have them find any little thing to disqualify me. I read somewhere: How are you’re problems different than anyone else’s? @marybeth – well stated comments. 58.5% of the population is employed according to BLS unadjusted numbers for April 2012. “Civilian labor force” is defined as Employed + Unemployed from among the “Civilian noninstitutional population”. This eliminates from consideration the enlisted, incarcerated, institutionalized and “Not in labor force”. 34% of the civilian noninstitutional population does not want a job right now. Included are “discouraged workers”, the unemployed, and the “underemployed” – those who have taken part time work in lieu of full time work. For those whose new full time job displaces what used to be a career it would appear that there is no official term for, or measure of, the lost economic resource of untapped expertise and specialization should a civil engineer ratchet down to warehouse labor. @UCD: I’m glad that you got a job, and one that pays more than subsistence and with a few benefits. I was having a conversation with a college student last week. She’s graduating next year, is considering a number of options including graduate or professional school if she can’t get a job. I hope that the job market improves before then. Another alumna and I were trying to tell her how important it is to get a job with benefits like health insurance, paid vacation time, paid sick time, paid holidays, etc. She wasn’t worried, said that she can remain on her parents’ insurance until she’s 26, which is true, assuming that the Supreme Court doesn’t rule the Health Care Affordability Act unconstitutional. She still wasn’t worried–she’s young, she’s healthy, and she figured she’d “wing it” without health insurance. When you’re older you think differently, and if your job doesn’t pay enough for you to buy a good health insurance plan out of your own pocket, you’d better hope that your employer offers a decent plan. I’ve worked for bosses who were alcoholics–it wasn’t a pleasant experience, and it does explain a lot of the behavior, but I wouldn’t want to work for one again. Been there, done that, don’t want to experience that again. They’re unstable, unpredictable, and the workers take the blame, especially if management chooses to turn a blind eye to his alcoholism because he’s the owner’s son/nephew/other relative/son of his college roommate/golfing buddy’s son (pick one). I hope that you find a job that is better suited to your talents. @Karsten: yes, I know, and that’s why I think it is a trick question. If the person interviewing you is moving up the ladder and not intimidated, he won’t take your desire (if you have it) to go into management as a threat. And if he’s insecure or the company is unstable, then any ambition on your part may set him off. It’s a silly game to have to play because no one is being honest. Maybe you would better serve the company doing hands-on projects. If it works for both of you, then there’s no need to be dishonest because you don’t know what the interviewer wants to hear and you don’t want to blow your chances. @Nick: this is a good topic, and one that we’ve all faced at some time, and, it seems, will face again in some form or another. To find a company that will be a good fit requires honesty–on my part and that of the company. That isn’t possible with such silly questions. After reading this discussion, I believe “So tell me a little about yourself” is an absolutely brilliant question. It allows the person being interviewed to convey something they want to present and enable them to help shape the course of the interview right from the beginning. It certainly isn’t a trick question because it is used so often. If you’ve prepared for the interview, you ought to be able to handle this. It’s not discriminatory. Why would an intelligent interviewee review potentially discriminatory information if it is not specifically requested? The question helps establish that the candidate knows what is relevant and is an initial look at their judgment. If they can’t answer this question in a way that moves their consideration forward, they probably can’t contribute effectively to staff meetings once they are on the job. If they tell their whole life story in an interview, they’ll waste time at other meetings as well. 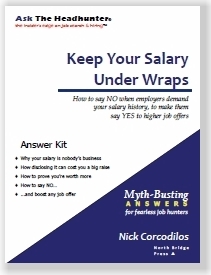 Nic, it’s a good thing you are self-employed, seeing that you are so temperamental that you would walk out the door when asked such a common question. There’s more to getting a job than knowing how to do the job—you have to be able to get along in the corporate environment. In all the places I’ve worked, I’ve never experienced a company in which you would be a good fit. An open ended question like this should never be asked in a job interview. It has absolutely nothing to do with your qualifications for the job. I think employers ask this as a way to get employees to talk about their personal lives because they know they not supposed to ask personal questions in a job interview. Have you ever tried….”Tell me something about yourself”? As a hiring manager I want to see where my candidate focuses himself. A resume is great but that on only one component and is an advertizing piece of paper. I have had such ramblings to this answer it really helps me understand this person will not be a good fit….you should hear some of the responses. 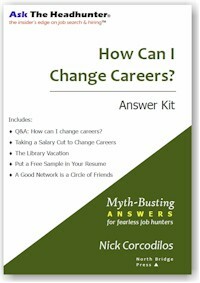 Asking open ended questions is one of the fundamental constructs of a good interviewer. This helps me understand more than a specifically focused question….although those are needed at times too. Also – a well crafted answer to this question gets people jobs. I have had it with the Tell Me About Yourself question. I put a lot of time into my resume and cover letter, especially the cover letter. Read it, take notes on it, and don’t ask questions you already have the answers to. Next time I am asked this stupid, vague question my response will be to the effect of: Everything of significance is in my cover letter and on my resume. Is there anything you’d like me to expand on? If they don’t like it, tough beans. The real me is analytic and matter of fact. Get to the point. Ask me job related questions that aren’t vague, check in on my former employees to get an idea of what type of worker I am, and give me an aptitude test for technical skills. Leave the analysis of my behavior to trained professionals.